I was just doing some updates on my website and this press release dropped into my inbox. Too good not to share. Have you ever wondered what Scotland’s longest-serving First Minister really thinks? Well, now’s your chance. 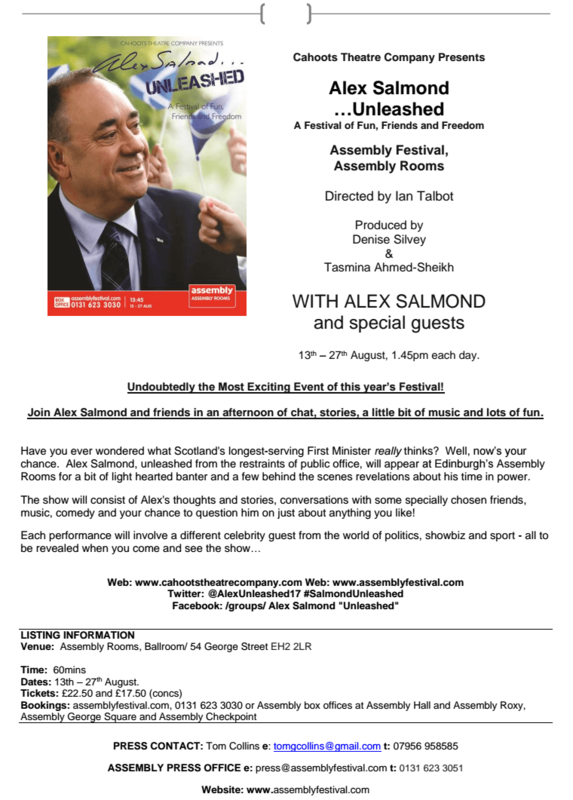 Alex Salmond, unleashed from the restraints of public office, will appear at Edinburgh’s Assembly Rooms for a bit of light hearted banter and a few behind the scenes revelations about his time in power. The show will consist of Alex’s thoughts and stories, conversations with some specially chosen friends, music, comedy and your chance to question him on just about anything you like! I am looking forward enormously to the show at the Fringe. Our objective is that every performance will be different with different topics and different guests. The only consistent feature is that it will always be light-hearted. The audience will get full opportunity in every show to play their full part. There will be a focus on politics, but not exclusively so. There also will be plenty on sport and showbiz. With so much change taking place in politics there is no shortage of opportunity or indeed targets for a wry look at current events. I have to say I quite like Alex, I’ve met him a few times, as First Minister, as an MSP & MP. He is very personable, knowledgeable and always remembers your name, where he last saw you and the context. Politics aside, I think the show could be interesting.